Big new developments in the case against World Vision for funding terror linked groups in Gaza. The Israeli Authorities have now confirmed all the claims Andrew Hamilton made back in 2012/13. Posted below the letter to the Australian Foreign Minister and a Press Release. We refer to the previous correspondence and discussion between Mr Andrew Hamilton and your office about the above organisations’ terror links and World Vision Australia’s funding of them. 1) On 28 March 2017 the Israel Security Agency (aka Shin Bet) declared that the Committee of Agricultural Works and the Union of Agricultural Work Committees are associated with the terrorist organisation the Popular Front for the Liberation of Palestine . (iv) the Registrar intends to submit an application to de-register the Committee of Agricultural Works. 3) On 6 April 2017 the Ministry of Justice Corporations Authority submitted a request for the District Court in Jerusalem to de-register and dissolve the Committee of Agricultural Works. These official statements from two Israeli Government authorities confirm and vindicate the 2012/13 warnings to World Vision Australia about the Union of Agricultural Work Committees & Committee of Agricultural Works summarised below. On 15 February 2012 World Vision Australia was put on notice that the Union of Agricultural Work Committees was a front for the proscribed terrorist group the Popular Front for the Liberation of Palestine. Subsequently throughout 2012 World Vision Australia was provided large amounts of evidence that clearly established the link between the Union of Agricultural Work Committees and the Popular Front for the Liberation of Palestine. World Vision Australia refused to accept this evidence citing the Committee of Agricultural Work’s Israeli government issued charity certificate as evidence that the Union of Agricultural Work Committees was “kosher”. World Vision Australia was then provided evidence that the Committee of Agricultural Works was a bogus charity and a legally separate organization from the Union of Agricultural Work Committees . Notwithstanding all of the above, World Vision Australia blatantly disregarded the compelling evidence of terror links and fraud and continued to both fund the Union of Agricultural Work Committees and provide false and misleading information to the Australian Government to obtain taxpayer funds. On 4 February 2013 a meeting was held in Tel Aviv attended by Shurat HaDin lawyers Mr Hamilton, Ms Darshan-Leitner and Ms Yifa Segal, and representatives of World Vision Australia including CEO Mr Costello. At the conclusion of the meeting after refusing to accept the obvious conclusions from the evidence presented to him, Mr Costello stated that “you need to get your hands dirty to do good work”. Mr Costello & World Vision Australia refused to accept the masses of evidence that they were funding a terror linked organisation and deceptively used Israeli government issued documents from one entity to obtain Australian government funds for another entity. They were well aware that they did not have clean hands. 5. s137.2 False or misleading documents. We request that the Australian Government conduct a full re-investigation into this matter, including pursuing criminal charges against World Vision Australia and Tim Costello and recovering from World Vision Australia all taxpayer monies obtained under false pretences. Further we believe that this matter, as well as the recent discovery that the head of World Vision in Gaza was a Hamas agent who diverted the majority of charitable funds to Hamas, which led to the exploitation of taxpayers funds and its misuse for illegal purposes, raise serious concerns in regards to proper due diligence done by World Vision Australia. This is especially concerning in their support for NGOs working in areas of the world where proscribed terrorist organisations are active and have substantial support. Our request to pursue criminal charges in this regard aims to serve not only the particular justice of this case, but for the Australian government to send a clear message, setting the bar high in its expectations from organisations such as World Vision Australia when it comes to risks of terror funding, particularly when involves its taxpayer’s funds. Terror organisations are masters of deception and NGOS working in these risky areas are wide-open to being infiltrated and co-opted by terrorist groups. As these episodes have demonstrated, the risk of the Australian government unwittingly funding terrorist organisations is too high for the Australian tax payer to accept. Previous From the Island to Zion. Next From Israel: The Firestorm and the Lesson. This information needs wide distribution, and I commend you for airing this. World Vision was one of the charities I used to give to, but when they became blatantly party political (Mr. Costello agitating against his own brother, the conservative Peter Costello during an election campaign), I stopped. Personally I believe that their real motivation for supporting islamic terrorism is ideological – they seem to be very much politically alligned with the Bob Carrs of this world as are quite a few NGOs and dont even start me on the UN subsidiaries! That is I why I’d rather give towards growing trees in Israel and bomb shelters to protect Jewish people from the rockets of those NGOs’ “friends”. It will be interesting to see when the so-called media pick it up, if they do. Picked up and linked to my Facebook page with appropriate community from me. I like Christians as a rule and have many Christian friends and even more than a few in my family. I wish World Vision would just be honest and mail out something like this when they do their next fundraising campaign. They have their eyes closed. They were presented with proof about 3/4 years back and refused to believe it. 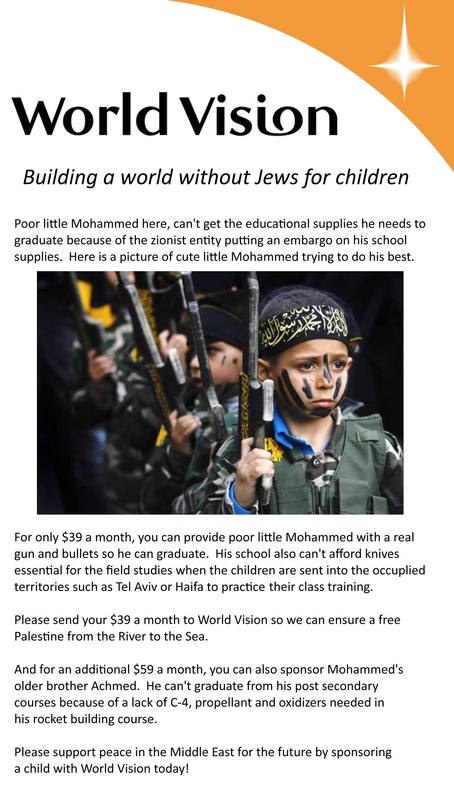 Pingback: World Vision “Getting Hands Dirty” …To Fund Terror « ISRAEL.CO.NZ | A response to Christian anti-Zionism and media bias.